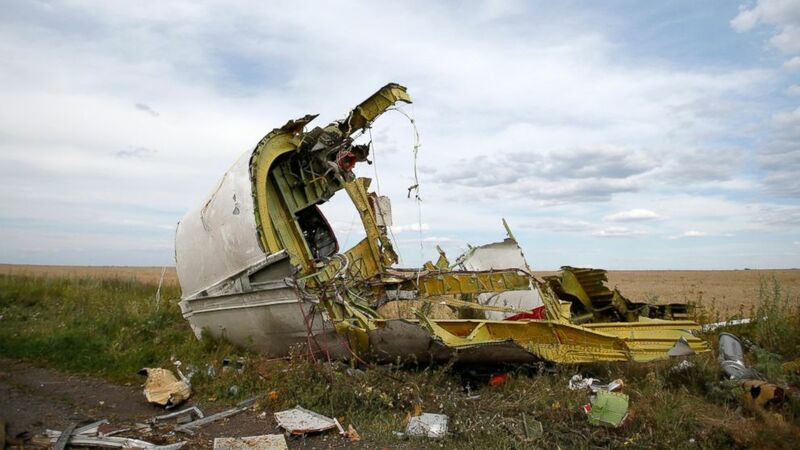 A part of the wreckage is seen at the crash site of the Malaysia Airlines Flight 17 near the village of Hrabove (Grabovo), Ukraine, July 21, 2014. A new independent report finds that Russia doctored photos to implicate the Ukrainian military in the shooting down of the Malaysian airliner MH17 last July, casting doubt on Russian claims that neither separatists armed by Russia nor its own military were to blame for the disaster. The report is the latest by the independent analysis group, Bellingcat, which has been using open source material -- often video and photos posted on social media -- to provide hard evidence that Russia has been sending troops and weapons into eastern Ukraine to support rebels there, despite denials from the Kremlin. Donetsk in the days around the shooting-down, meant to imply that the Ukrainian army had hit the plane. After 30 pages of analysis, Bellingcat says "unequivocally" that these images have been digitally altered so as to falsely appear that they were taken in the days around the crash. The photos were actually taken in the first half of June, the report says. Besides the altered dates, Bellingcat says the photos exhibit many signs of being Photoshopped, apparently to conceal objects that would betray they were taken a month before -- adding cloud cover for example. The group says it is clear proof that Russia's government has lied in connection with the crash. "These claims, representing the majority of information publicly presented by the Russian government since the downing of Flight MH17, are a clear attempt by the Russian government to deceive the public, global community, and the families of the Flight MH17 victims," Bellingcat said in a statement released with the report. The downing of MH17 caused outrage around the world and prompted western countries to impose harsher sanctions on Russia for its role in arming pro-Russian separatists. fighter-jet had been nearby and giving a false flight-plan for MH17; the separatists have even suggested the plane was full of corpses before it took off. Bellingcat says it has now proved four major statements by the Russian defense ministry on MH17 as deliberately false. It adds to a growing pile of evidence that Russia's government is trying to conceal its military's activity in eastern Ukraine; modern tanks, only in use by Russia, have been repeatedly spotted and serving soldiers have posted on social media showing themselves fighting. Last week Vladimir Putin issued a decree making details of troop deaths during special operations in peacetime a state secret, following a steady trickle of reports of Russian soldiers killed in Ukraine. Russophobia at work,western media propaganda. BUK missile manufacturer on MH17 shooting over Ukraine. The BUK missile manufacturer revealed its own findings into the flight MH17 downing over Ukraine, effectively proving that a missile type consistent only with the Buk-M1 system was used  one that the Russian armed forces do not possess. Well said mkuu, the plane was hit by air to air missile fired by an Ukrainian Airforce fighter SU-24.